To celebrate the recent launch of her debut book The Body Balance, a modern guide to Ayurveda, Eminé Ali Rushton – Beauty and Wellbeing Director at Psychologies Magazine – shares a beautiful spice-infused Spring salad recipe for balancing the body. 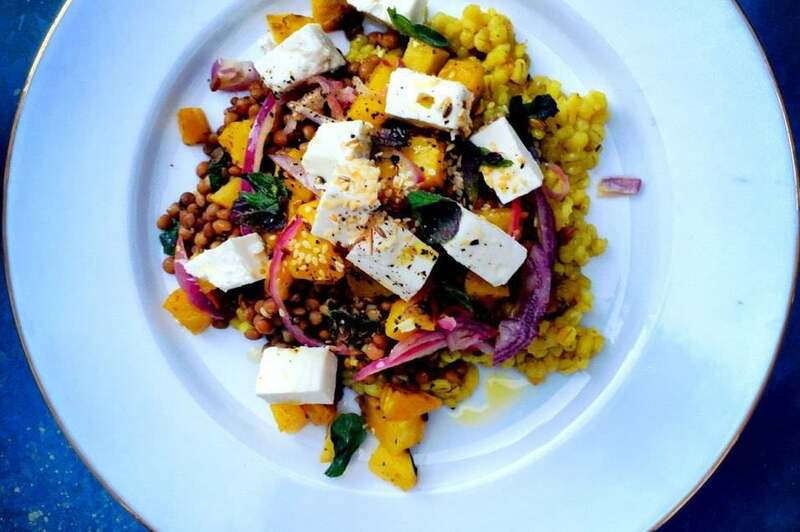 Best described as a mild-spice infused pearl barley, golden beetroot, green lentil and feta salad. This is a vibrant, filling, cooked salad, doubly satisfying for its variety of textures, colours and hints of spice, that celebrates light and sweet golden beetroot, mint and parsley, all of which are coming into season now. Add your barley to a large pan of boiling water, stir in your saffron, bouillon, ground turmeric, paprika and cumin and simmer for 35-40 minutes until tender. Drain excess liquid, stir with a fork and allow to cool. In a baking dish add a splash of good rapeseed oil and a sprinkling of paprika to your cubed beets and roast for 30 minutes in an oven preheated to gas mark 7 / 220 degrees Celsius until tender and slightly charred at the edges. Dress your lentils in a separate bowl with olive oil, lime juice, salt and pepper to taste. Slice and fry your red onion in a little olive oil until translucent but maintaining a little crunch. On a large plate, spoon a base of pearled barley, add the dressed lentils on top, and cube over the feta cheese. Scatter over your red onion and dress with fresh flat leaf parsley, a sprinkling of red chilli flakes and toasted cumin seeds and a grating of nutmeg. Finish with a further drizzle of extra virgin olive oil, fresh mint, a squeeze of lime, pinch of sea salt and a generous grind of fresh black pepper.